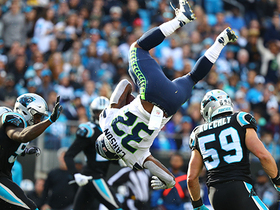 Blount rushed for three yards on three carries and added a 23-yard reception during Sunday's 28-14 loss to Seattle. Blount ran for 50 yards and a touchdown on 10 carries during Sunday's 32-21 win over the Dolphins. Blount rushed 12 times for 22 yards and two touchdowns in the Lions' 31-23 win over the Packers on Sunday. 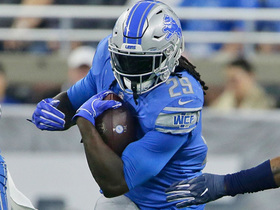 Analysis: Although he couldn't clear 2.0 yards per carry, Blount scored a couple of trademark touchdowns of one yard apiece in the Lions' strong first quarter. The veteran bruiser hasn't only averaged more than 4.0 yards per tote in one game this season, but with rookie Kerryon Johnson going down with an ankle injury Sunday, Blount could see his role increase if the rookie were to miss multiple weeks. The 31-year-old will next suit up against the Dolphins in Week 7 following a Week 6 bye. Blount (illness) doesn't have an injury designation for Sunday's game against the Packers. Analysis: Blount missed practice Wednesday and was limited Thursday, but the Lions cleared him for Week 5 after he managed a full session Friday. He may be limited to mostly goal-line and short-yardage work with Kerryon Johnson emerging as an effective runner on early downs. Blount (illness) practiced on a limited basis Thursday. Analysis: Absent Wednesday due to an illness, Blount's return one day later, albeit with a cap on his reps, is a step in the right direction. Even if he's listed on the Lions' final Week 5 injury report, he appears as if he'll be available Sunday against the Packers. On the season, Blount ranks third in offensive snap share (25.5 percent) among Detroit running backs behind Theo Riddick (42 percent) and Kerryon Johnson (38 percent). 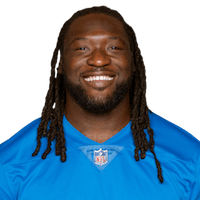 Blount (illness) was present for the start of the Lions' practice Thursday, Tim Twentyman of the Lions' official site reports. Blount didn't practice Wednesday due to an illness, Dave Birkett of the Detroit Free Press reports. Analysis: Fortunately for Blount, he's ill between games rather than right before the 1 p.m. EDT kickoff of Sunday's game against the Packers. Still, his activity -- or lack thereof -- will be one to watch as the Lions prepare for the divisional showdown. If Blount's illness lingers into the weekend, it could be mean more reps for others in the backfield, specifically Kerryon Johnson. Blount isn't present for practice Wednesday, Justin Rogers of The Detroit News reports. Analysis: Blount may have suffered an injury in the process of taking seven carries for 12 yards in Sunday's 26-24 loss to the Cowboys. His potential absence Week 5 against Green Bay wouldn't necessarily be a major loss for the Detroit offense, considering rookie Kerryon Johnson has piled up 199 yards on just 33 carries the past three weeks. Healthy or not, Blount is in danger of seeing his role reduced to little more than goal-line and short-yardage work. Blount rushed seven times for 12 yards during Sunday's 26-24 loss to the Cowboys. 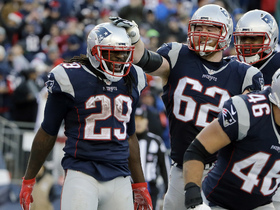 Blount rushed 16 times for 48 yards during Sunday's 26-10 victory over the Patriots. He also secured both of his targets for 17 yards. Blount was ejected from Sunday's game in San Francisco, Chris Burke of The Athletic reports. 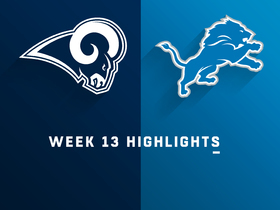 Analysis: One of three active Detroit running backs Week 2, Blount's ejection resulted from coming off the sideline to shove 49ers linebacker Elijah Lee, who had a close call on a hit of Matthew Stafford near the Lions bench. There's no telling if the NFL will impose some sort of punishment on Blount, but Kerryon Johnson will emerge from this game unscathed, unlike Blount, Theo Riddick (who picked up an ankle injury) and Ameer Abdullah (who was inactive again). Blount (shoulder) will play Week 2 against the 49ers, Jason LaCanfora of the NFL Network reports. Analysis: Blount's had a confusing week. He was a full participant in practice Wednesday and Thursday before landing on Friday's injury report as questionable. He logged just 13 snaps Week 1. Blount (shoulder) is listed as questionable for Sunday's contest in San Francisco. Blount (shoulder) was a full practice participant Wednesday, Michael Rothstein of ESPN.com reports. 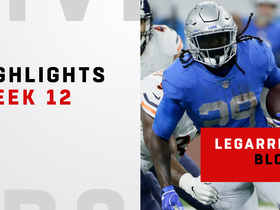 Analysis: Blount appeared to hurt his leg or knee during Monday's 48-17 loss to the Jets, but he's listed on the Lions' first injury report of the week with a shoulder issue. Regardless, his full participation suggests he should be fine for Sunday's game in San Francisco, where he'll continue to work in a committee with Kerryon Johnson and Theo Riddick. Blount lost three yards on his four carries in the season opener and will have a hard time getting work whenever the Lions are forced into catch-up mode. 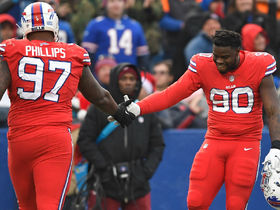 Blount appeared to have his left knee hyper-extended after being tackled in Monday's game against the Jets and was taken into the locker room, Justin Rogers of the Detroit News reports. 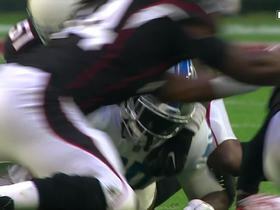 Analysis: Blount had his leg bent back awkwardly after being tackled in the backfield during the third quarter and appeared to be in a lot of pain. The severity of Blount's injury remains to be seen, but if he's forced to miss the rest of the contest expect Kerryon Johnson and Theo Riddick to increase their snap-count. The veteran running back has four carries for minus-three yards before exiting. Blount took 11 carries for 45 yards in Friday's preseason game against the Buccaneers. Blount suited up for Friday's preseason opener against the Raiders and rushed five times for 21 yards. 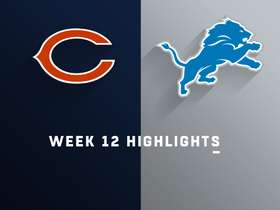 Analysis: Blount got the start but didn't see a whole lot of work, as the Lions took it easy on a number of their first-string players, including quarterback Matthew Stafford, who didn't even play. Nonetheless, the bruising veteran was relatively efficient with his carries and made it out of the game injury-free before letting rookie Kerryon Johnson take the reins of the backfield. The next chance to see Blount in action will be during Detroit's second preseason game next Friday against the Giants. Blount (undisclosed) is back at practice Monday, Tim Twentyman of the Lions' official site reports. Analysis: Blount was removed from Sunday's practice early but won't miss any additional time. While his roster spot and short-yardage role aren't in any danger, Blount could lose carries to Kerryon Johnson if the rookie looks sharp during training camp and the preseason. With Theo Riddick locked in on passing downs and Ameer Abdullah hoping for a minor role, the Lions are clearly headed for a committee approach in their backfield. Blount left Sunday's practice early with an undisclosed injury, Kyle Meinke of MLive.com reports. Analysis: Blount reportedly walked off the field under his own power, so it appears to be a minor issue. Additional updates should be provided soon regarding the location and severity of the injury. 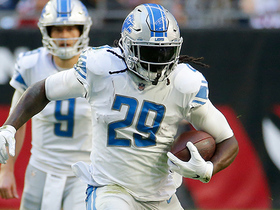 Blount is currently penciled in as the Lions' starting running back, but if he does miss time, Theo Riddick and Kerryon Johnson would be in line for more reps in the backfield. 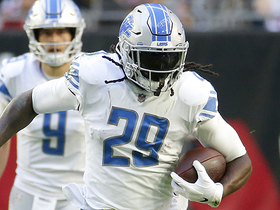 Blount, Ameer Abdullah and Theo Riddick all got significant run with the first-team offense at June minicamp, Justin Rogers of The Detroit News reports. Blount's one-year contract with the Lions includes $2 million guaranteed and another $2.5 million available in incentives, per Ben Volin of The Boston Globe. The Lions signed Blount to a one-year contract Friday, Ian Rapoport of NFL Network reports. Blount rushed 14 times for 90 yards and a touchdown in the Eagles' 41-33 win over the Patriots in Super Bowl LII on Sunday. Blount rushed six times for 21 yards and a touchdown but wasn't targeted in the passing game during Sunday's 38-7 NFC championship win over Minnesota. Analysis: Blount contributed little outside of an 11-yard rushing touchdown that gave his team a 14-7 lead early in the second quarter. While Jay Ajayi is certainly the favorite to lead Philadelphia in carries during the Super Bowl after getting 18 rushing attempts in this one, Blount's two-game touchdown streak suggests he has a decent chance of finding paydirt against his former team. Blount carried nine times for 19 yards and a touchdown during Saturday's 15-10 win over the Falcons. Analysis: Blount managed an uninspiring 2.1 yards per carry on the day, but he did score his team's only touchdown on a one-yard plunge in the second quarter. Jay Ajayi racked up 98 scrimmage yards on 18 touches and is clearly the team's lead option at this stage. That said, Blount still saw a respectable workload and should remain the top option for short-yardage situations in next week's NFC championship game against the Saints or the Vikings. Blount carried nine times for 37 yards and caught his only additional target for 11 yards during Sunday's 6-0 loss to the Cowboys. Blount rushed seven times for 21 yards in Sunday's 34-29 win over the Giants. Analysis: Three of his carries came with the Eagles in clock-killing mode on their final drive, forcing the Giants to burn all of their timeouts. It marked the third straight game Blount was on the field for 17 or fewer snaps and saw nine or fewer touches. After failing to produce in successive plus matchups, the 31-year-old cannot be trusted for fantasy purposes in Week 16 against Oakland. Blount ran seven times for just 12 yards and caught both passes directed his way for 11 more yards. Analysis: The contest marked the second straight game in which Blount was only on the field for 15 or fewer snaps, and this time it was far fewer than the 27 Corey Clement saw or 43 for Jay Ajayi. Seven of Blount's touches came in the first half, but in the second half, Philadelphia turned primarily to Ajayi, who was far more effective with the ball. It will be tough to rely on Blount for fantasy production in spite of another favorable matchup Week 15 against the Giants. Blount only logged 14 snaps on offense in Sunday's 24-10 loss to the Seahawks, taking eight carries for 26 yards. Blount took 15 carries for 97 yards and lost a fumble in Sunday's 31-3 win over the Bears. Blount rushed 13 times for 57 yards in Sunday's 37-9 trouncing of the Cowboys. Analysis: Blount led the Eagles backfield in touches and was one of three ball carriers to rush for at least 50 yards in the game, along with Corey Clement (50) and Jay Ajayi (91). However, it took the burly back as many carries as the other two combined to reach his total. If Clement continues to emerge and Ajayi learns more of the playbook, it stands to reason that Blount will begin to lose touches if he cannot prove himself a more effective runner. Blount rushed for 37 yards on nine carries in Sunday's 51-23 romp of Denver. Blount will remain atop the depth chart for Sunday's game against the Broncos and is expected to serve as the Eagles' lead back, Matt Lombardo of NJ.com reports.